by Tyrone Alcorn, Bookkeeper/Accountant, Break Diving, Inc.
A car purchase can be daunting. Not armed properly with the right knowledge, you can easily overpay by thousands for that brand new vehicle you love. For most of us, our car purchase is the biggest single point of negotiating failure in our lives, and at the same time, one of the most valuable assets we own. Doesn’t it make sense to learn how to better negotiate this big purchase? 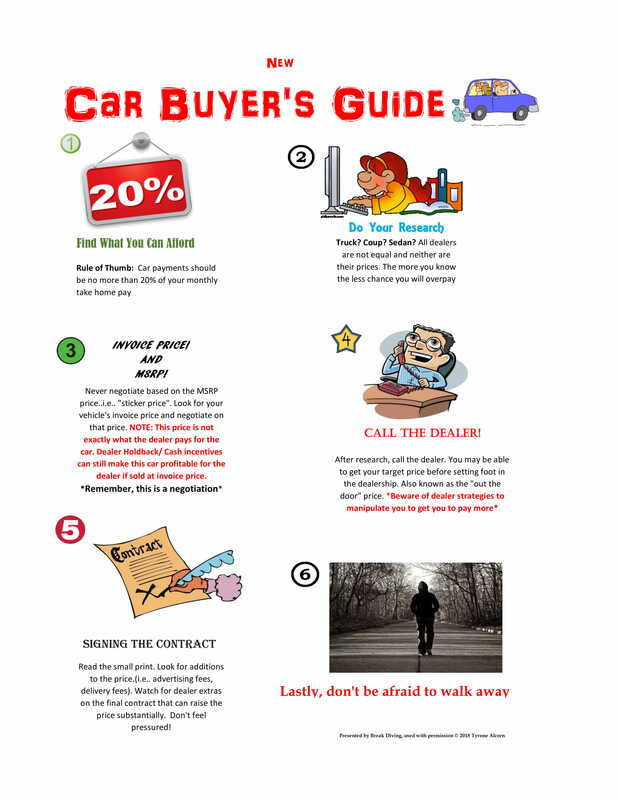 What follows is a quick post sharing some of the best tips for how to buy a new car and not get ripped off, complete with a very handy one-page illustration that I created. I would like you to read this simple car guide and bring it with you when you go buy you next new car. It’s time to become a proficient new car buying negotiator. I hope this simple car buying guide will lead you in the right direction. Knowledge is power and as we all know, break divers strive for knowledge.